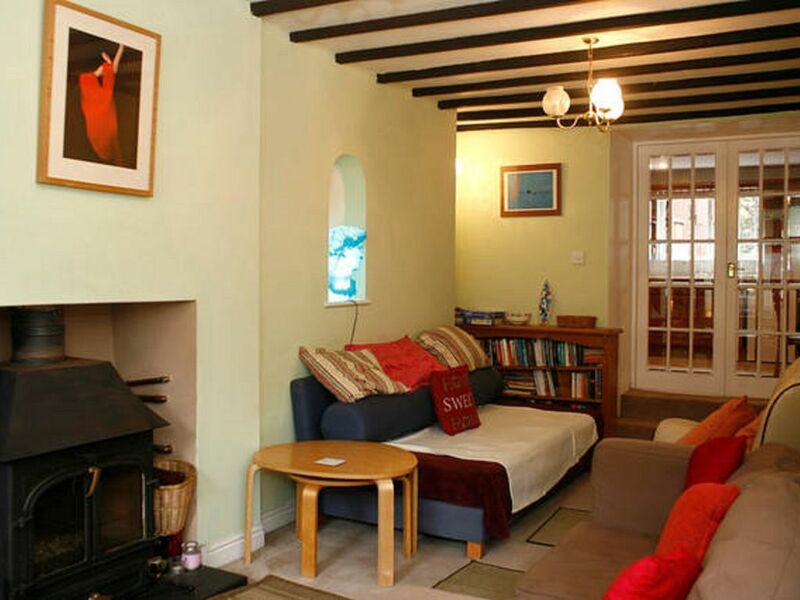 Set in the picturesque setting of Beddgelert, lakes, mountains and rivers. Set within the gorgeous village of Beddgelert, situated in the foothills of Snowdon, there can be no greater escape from the hurly burly of modern day life than this. The property is a classical stone built cottage which has been tastefully modernised within, providing modern comfortable accomodation including a log burning stove set within a feature fireplace. The cottage has been awarded a four star rating by the Welsh Tourist Board. The open plan lounge is complemented by a modern dining kitchen with modern electrical appliances including halogen hob. To the rear of the property is a spacious garden area that enjoys sunshine all day. Watch the sun set behind the mountains as you sip a nice aperitif, before enjoying a lovely barbecue. The property benefits from two ample bedrooms. The front bedroom has bunk beds and one single bed. The beautifully decorated main bathroom has a bath with shower over, pedestal hand wash basin and wc. It is a lovely light airy room benefitting from a skylight. After a hard day's walking in the mountains you can take a nice long relaxing bath. The main bedroom at the rear of the property has a double bed with fitted wardrobes and an en-suite bathroom. The en-suite is finished to the same high standard as the main bathroom. With corner shower unit with electric shower, pedestal hand washbasin and wc. The property enjoys free mountain views to the rear and is less than a stone's throw away from the Glaslyn river which rapids its way through the village. The roar of the river is a relaxation inducing feature of this spectacular mountain location. The property benefits from economy 7 night storage heating and the radiators and hot water are heated by the log-burning stove. Electriciy is included in the rental price. There are a number of mountain walks some starting literally from the doorstep of the property. Lakeside and coastal walks are also within easy distance. There really is something for everyone in this idyllic part of the world. My grandparents had a cottage in this gorgeous village and I have been visiting Beddgelert since I was a baby. When my Gran passeD away we sold her cottage, no 18. 20 years later I went back to the village and found this place for sale. It was and still is like coming home and that's the experience we hope you have when you visit Beddgelert and stay in our homely cottage. I have travelled the world and currently live abroad. But I know of nowhere more beautiful than the stunning mountains, lakes and rivers of Snowdonia, not to mention the stunning coastline just a 20 minute drive away. This cottage whilst retaining some original features of this miners cottage, has been renovated and extended to provide ample, comfortable, family accommodation. All the comforts of home, with the mountains and lakes on your doorstep. A warm welcoming multi-fuel burner in the front room, modern appliances in the kitchen, 2 bathrooms, one en-suite and a family room. The main bathroom has a bath with shower over, with first class fittings. The en-suite is a compact but equally well fitted bathroom with electric shower. Couldn't ask for a better location for exploring Snowdonia. This cottage is in the middle of the stunning village of Beddgelert (lovely village store, craft shops, pub / restaurants & amazing ice-cream shop). Compared to other properties this cottage is much cheaper. It has all the basics but needs updating (some kitchen cupboards coming off, top bunk mattress uncomfy, DVD remote doesn't work etc). Spent 5 nights in Beddgelert, the cottage was lovely and warm, weather was still chilly outside. Very relaxing and enjoyable stay. Beddgelert is a lovely village with fantastic walks from the doorstep. This cottage is extremely warm especially in the mornings. The wood burner is great on an Autumn night. The whole cottage needs updating and some modern appliances added (e.g. : washing machine, dishwasher, more modern shower) as well as more comfy sofas etc. Has all you need for cooking etc. For the price, linen and towels should be provided. We all loved the village, sygun copper mine, Welsh Highland Railway and the many walks from the door. Thanks for staying with us and for your comments. Our advert does not claim to offer washing machine or dishwasher, nor does it offer linen and towels. The latter is not untypical in rentals in the area, the property is Welsh Tourist Board graded accordingly, we are happy to provide these on request as communicated during the booking process. What we do offer unlike other cottages in the area is free electricity. As your comment notes, the cottage is always warm, no need to go to pay for a meter card prior to getting the fire going to get the place warm on arrival. Plentiful hot water is also always available as a result. We have had a very busy year and the shower and sofa have now been updated once we had a break in bookings. I look forward to welcoming you again in the future. Comfortable cottage ideally situated for all the walks in Snowdonia. Road parking is an issue as everyone wants their space, but it was a minor hassle as you are so close to Beddgelert village. In the vicinity you can find pony trekking, mountain biking, fishing, rock climbing. Within 8 miles you can find the following coastal activities: sailing, wind-surfing. There are also beautiful links golf courses and the whole coastline is dotted with stunning examples of medieval castles which are all incredibly well preserved. The property is available for rental on a weekly basis. Changeover day is Saturday. Guests are requested to arrive at the property no sooner than 3pm and to leave the property by 10am at the end of their stay. Weekend and short term lets are also available. All rates are inclusive of electricity: heating, hot water and lighting. Also broadband is available free of charge at the property.